The Story of HBCU Greats Who Should be In the Pro Football Hall of Fame. Four Quarters of Soul tells the story of Black college football, and, many of the great players and coaches it produced. At the same time, it tells the story of the great players and coaches who made Black college football great. Ultimately, it tells the story many great players who went on to join the professional ranks, and, brought honor to their respective teams, and, the league. While many of their peers and teammates have been properly honored for their efforts, there remains a number of these men who have been overlooked when their full body of work is considered. Because of this oversight, they have not been properly honored when it comes to being elected to the Pro Football Hall of Fame. In this book, you will get an overview of the players and coaches who built HBCU football at a time when Blacks could not go to majority institutions. At the same time, they helped to build the game that we love. With the assistance of a panel of knowledgeable sports journalists, we have compiled a list of personal favorites. We have also compiled a list of players based purely on their records which clearly show their qualifications to be enshrined in the Pro Football Hall of Fame. This book is a collaborative effort on the part of writers with a wealth of knowledge on Black college athletics, college and professional football. 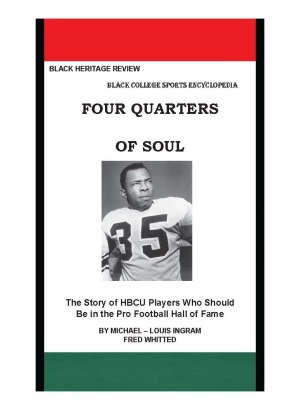 It is being published as a Legacy Edition of the Black College Sports Encyclopedia. This is another step towards telling our story to the nation and the world. To order online, click on the button below.